Top-Loading Balances differ from scales and other balances in readability and capacity. 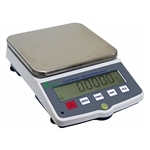 Available at a much lower price point than analytical, semi-micro or other super-precise balances, these top loading balances are appropriate when the result must be within a 0.05 g margin of accuracy. The toploading balance is slightly more basic in the sense that it provides minimal protection from air disturbances, static electricity and other environmental factors that could affect an extremely precise lab weighing result.